Excuse me for probably a stupid question. I had created a Nebula account some months ago, and put the final configuraiton on hold for various reasons. Today I could continue adding the two APs (2x NWA1123-ACv2) but no matter what, the two APs remain offline in NCC. 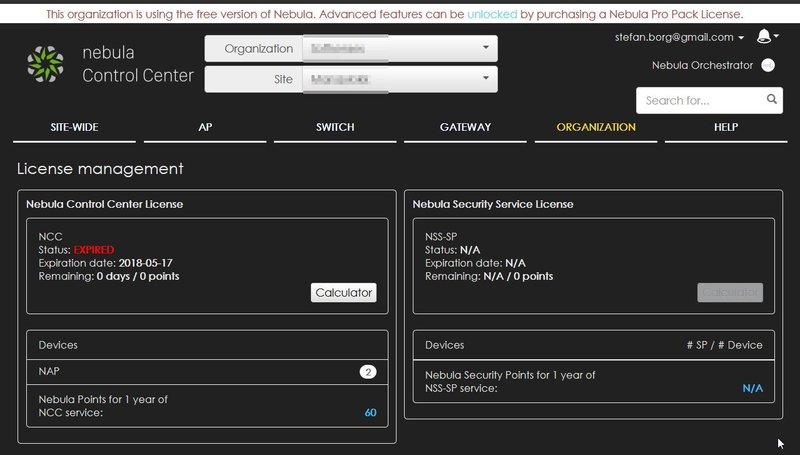 My Nebula account is "free" after all this time, but I did not find any reference I could not get the two APs registered in NCC at least with basic functionality. Is this an issue of licensing? I'm attaching some screenshots of NCC which could help in understanding. I have been referring to the following link on what I can do with the "free" version. Either I'm misunderstanding or something is wrong with my configuration. So the rootcause of this is that the gateway @sborgMT is using, a Kerio Control firewall, has by default IRC inspections on port 6666-6668. After disabling it allowed device to go online. It is rather strange our protocol is not using IRC though on the same port, the firewall still manages to block them. If anyone who has an Kerio Control remember to disable it if you are using Nebula devices. First of all, the connectivity has nothing to do with any license related. Only thing requires it to go online is the network connection. If your firewall is not blocking the sessions for it to reach the server, you can try to switch the uplink to a different network to test if it is an ISP issue. To start with you can connect the AP to the uplink in front of your gateway to try if that is the cause. The connection is unrestricted, and actually I can see it talking to the nebula site (destination 6667 and 443). I talked to Zyxel this morning on the phone, and they said that I should reset the APs to default config. I did that, and then they saw from the AP interface that the management mode was still "standalone" and that it should be "managed". They referred me to the CLI to change it manually using "hybrid-mode managed" but the CLI is only accepting "hybrid-mode cloud" or "hybrid-mode standalone". If I try "hybrid-mode managed" I get a parse error, and if I "hybrid-mode ?" I only get standalone and cloud as accepted options. I changed it to "cloud" and the interface of the AP changed, all the settings are gone and it's "waiting" for the configuration from NCC. The AP's interface is saying that it is connected to the Internet, but it's not connected to Nebula and that it's not registered with Nebula. I am 100% certain that the connection is unrestricted, and a PC on the same network as the AP can connect successfully to the same IPs and ports that the AP is opening towards nebula. What is worrying me is that the CLI PDF for these APs that Zyxel gave me over the phone (attached, section 9.3.1) is not consistent with the commands that the AP is accepting through SSH. The PDF they gave me is for the same firmware version as the version on the AP, and both are the latest firmware so something is very wrong on the APs. And I am now testing with 4x different APs, all the same NWA1123-ACv2. All with the same behavior and all with the same problem when using the CLI. Grrr... this is becoming a real head banger! We normally don't use CLI to interfer with the state of the AP, potentially it might cause unsynced running configs for cloud devices. Personally I think the issue lies beyond your network and probably has something to do with the ISP. We sometime have customer's ISP blocking 6660-6668 ports. As we have noticed that our channel support asked us about your case, I've checked on the server side there was no records of established connection. So I think one thing to try now is take one device, connected it to network from a different ISP or 3G/LTE uplink.